This may be my favorite of the Muppet covers I've done. Gonzo is my favorite Muppet and I didn't feel like I really nailed my take on him on the two other covers he's been featured on. I'm also pleased with the water (inspired by Windsor McKay) and the coloring. I think Peter Pan #1 ships soonish from Boom. My pal Jay Fosgitt has a book coming out from Ape called Dead Duck (Previews Sept090577). Jay has a great sense of humor (a nice blend of Muppets, Monty Python, and Benny Hill) and Dead Duck is his way of pouring that funny stuff right onto the page. 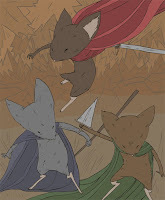 I warn fans of mine that it is more adult than Mouse Guard, but fun for those old enough to appreciate it. Oh, and here is My take on Dead Duck and Zombie Chick. congrats David for another week on the NYTBSL! Not at all surprised, and thanks again for the interview! Actually, I felt like you've always drawn Gonzo great (no pun intended, but fitting nonetheless). I particularly liked the Muppet Robin Hood cover you drew where he's lying on the ground. That reminded me of the best Muppet illustrators' work, Bruce McNally particularly. Have a great time on your current travels! I love this Muppet Peter Pan cover, it's definitely my fav. I also love Matt's fan art! It has a wonderful style to it. Seeing fan art is one of my favorite new things that you've been posting on your blog. Wow I love the Muppets cover and congrats on Winter being a bestseller! Your covers for Muppet comics have been outstanding. Any chance you'll get to do the interior art on a future Muppet project? Smoothie: At this point any interior work I would do on a Muppet book would have to be a very limited page run to fit into my schedule with Mouse Guard. But I'd love to do a short Muppet story!